This is an account of the 1986 Mets, they beat the Red Sox in the World Series. The Red Sox almost won it in game six, an error that created the word “Bucknered” allowed the Mets to win and go to game seven. Jeff Pearlman is a Mets fan, you find this out in the beginning of the book, and he grew up to be a sports writer. He begins his narrative of the ’86 Mets by introducing us to Cashen, GM of the Mets. He promised the owners he could build a championship team, but it would take time, he was right on both fronts. The ’86 Mets were not nice guys, they drank, did drugs and chased women (even some of the married players). Most of their games they came into the clubhouse to find coolers of ice cold Budweiser. The drugs of choice were cocaine and amphetamines (speed, pep pills, uppers and greenies), and getting drunk in the back of the plane was common. 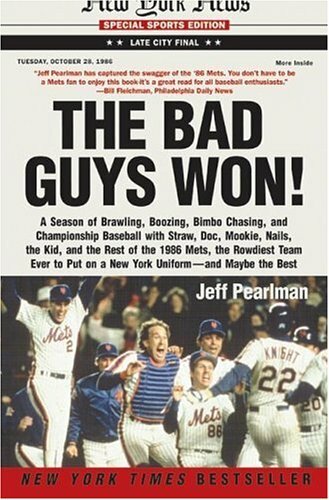 While Pearlman is definitely biased towards the Mets, this is a very candid look at the team, through interviews with former players, batboys, managers and many associated with the Mets organization, it is a very well rounded look at a championship team filled with ‘bad guys’. He has knowledge of the playing side of a team as well as the business side of it, how sometimes practicality overcomes sentimentality, and times that it should. His writing is easy to follow, he makes generous use of similes, Darryl Strawberry is described as “wholesome as a Nevada brothel”, “as charming as a starved pit bull” and “as lovable as a cobra”. He talks about a pitcher who’s pitches made him “as threatening as a doe at a rifle club”. This is a very interesting book that I would recommend to baseball fans in general and Mets fans in particular. Posted by Belleza on June 10, 2012 in 2012, Non-Fiction and tagged 3 Stars, Baseball, eBooks, Jeff Pearlman, Library Book, Recommended to read.